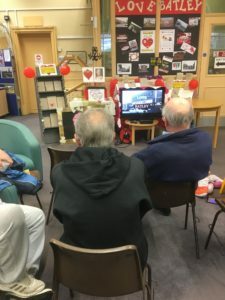 Friday 10th February saw our ‘Love Batley’ Event featuring a short film made by Simon Roadnight, Chair of the Friends of Batley Library Committee, where local residents extol the virtues of our town. The film is now available, in full, on Youtube. The film was preceded by a talk from local military historian John Rumsby about two lovers during World War One, based on their old letters he found in an attic in Huddersfield. John told the story of Henry Coulter, a young tramways clerk who enlisted in 1915, and his lover Lucy Townend. As we discovered, their letters gave no real insight into the war or other military details, but they did give us a look into the hopes and dreams of two young people during this period. If you have any ideas for events that the library could host, or talks you think we might be interested in, feel free to contact us with your suggestions, we would be interested to hear them!